Give your best friend, boyfriend, girlfriend, or frenemy the gift of Drake: 30 days of Drake for $6. Provide us with their phone number and we’ll send ‘em one picture and quote of Drake everyday for 30 days. Don’t worry, they’ll thank you later. Drake is like a fine wine… robust, complex and made up of many different characteristics. He’s provided us with an abundance of sad, serious, and funny quotes and pictures that we want everyone to enjoy. We know how hard it is to go a day without Drake. And now your friends don’t have to. Don’t think we’re serious? Try us. We’re way too committed to this, and we will send you the Champagne Papi’s best shots and lyrics to take your day here...from the bottom. Where can I get my daily Drizzy fix? 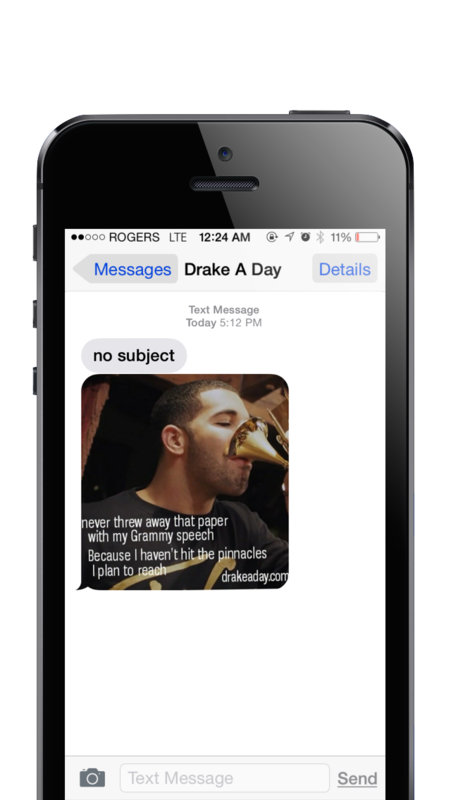 Drake A Day is sent via MMS message so there are no incoming charges and no data costs for whoever you sign up to receive these daily gifts. When will the messages start rolling in? You don’t want to. But if you do (but you don’t), just tell your pal to reply with the word “STOP” and the parade of happiness will stop. Welcome back to your senses. Just reply back with "START" to the same number to have Aubrey back in your life. I didn't receive my daily fix of Drake today! Not cool. Contact us and we will make things right. Oh no! I entered the wrong info! If you’re reading this, it’s not too late. Just give us a shout and we’ll take care of it. We won’t sell your friend’s number, and payments are done through PayPal. You're all good don't sweat!